Today my sense of direction and map reading has failed me miserably. Never mind, no harm done, but I did spend a lot of time stopping my bike to check the map, then continuing on convinced I knew where I was going, only to end up somewhere unexpected, again. I also seem to be suffering from Museum fatigue. So I haven’t really “done” Kalgoorlie at all – having seen none of the sights I thought I might. I did enjoy an excellent coffee with a banoffee tart at Relish café in the main street though – super yummy and by far my highest priority today! 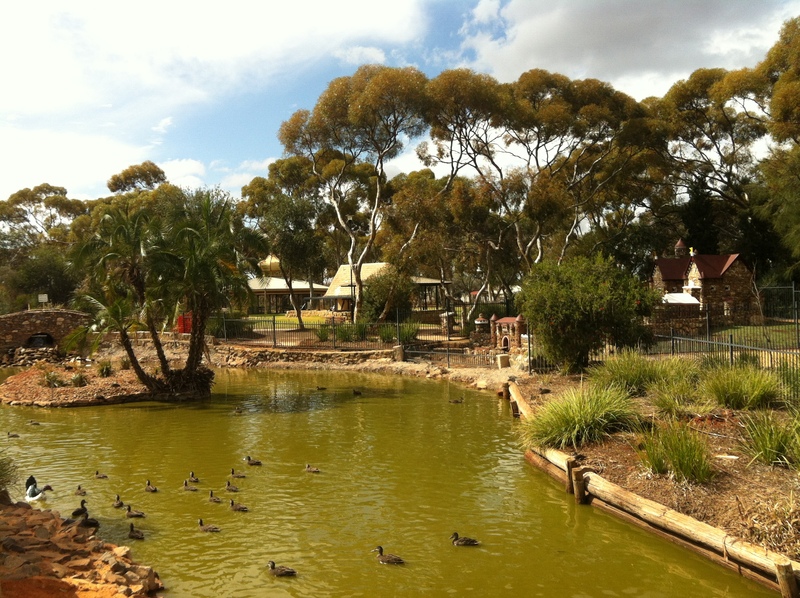 The standout discovery of the day was Hammond Park – what an oasis! After cycling the much lauded cycle path along Gribble Creek, through Centennial Park and the Arboretum, I began to think there was no greenery to be seen in Kalgoorlie. But I was wrong. Lush green lawns, a large pond with ducks and geese (shame about the colour of the water though! ), loads of large shady trees, pavilions, bbqs and shelters galore, huge kids playground, a café (presumably open at some point! Not today) and curiosities such as a small Bavarian castle and aviaries with a range of birds, emus in the neighbouring animal sanctuary. It’s a really pleasant place to be. It’s what Geraldton lacks. On that score – Kalgoorlie compared to Geraldton? Same same, but inland. 🙂 It definitely feels more like a city, has a lot more vibe about it. On the whole much more promising pubs, though every one of them seems to think it’s essential to have a skimpy prominently advertised. Much nicer buildings, though the contents of them are generally just like any other city or large town. I like the prominence of the back laneways running down suburban blocks all the way from Kalgoorlie to Boulder – a reminder of earlier times and primitive sanitation! The city’s surroundings however are generally pretty ugly – it’s basically pretty brown and dirty. For me, it lacks a large body of water. Again, that’s the coastal girl in me coming out. I like Boulder’s main drag more actually – which is odd considering it’s basically pretty abandoned, or has seemed that way whenever I’ve passed through it the last few days. This is a result of the recent earthquake I suppose, perhaps a lot of buildings are still structurally unsound – but it’s odd because there’s no obvious evidence of damage that I can see. It’s smaller, quieter than the main drag in Kal – I guess I’m coming to realise that’s what I prefer. But the presence of the super-pit is everpresent – with a large flat-topped brown earth structure that is the lip of the pit forming the eastern backdrop to the famous Burt Street. I drove up and had a look from the public viewing platform. It is impressive. But also disturbing. Our greediness as a civilisation apparently knows no bounds. This entry was posted in Uncategorized and tagged Kalgoorlie. Bookmark the permalink.